More than just a PSM tool, the MOC module can be used for any type of change within your organization. 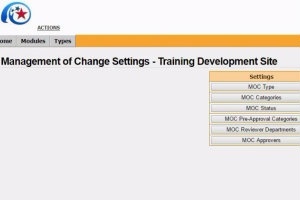 As you’re designing your overall MOC strategy, the module allows you to define a variety of change types with different parameters. Any time you create an individual MOC, you’ll begin by selecting its type. To create more granularity and data consistency, you’ll also define MOC categories, each with its own set of parameters. Every MOC is defined in part by its category, and you can select which categories apply to each type. Ultimately, this organizational system makes it easier for you to set the pre-approvals, reviews, approvals and checklists involved in every change. The MOC module also allows you to use predefined and custom status types, such as “active,” “hold,” and “complete.” Each time you create or edit a status type, you can select the MOC types and categories to which it applies. For instance, you may want to disable the “hold” status type for categories and types intended for emergency projects. Pre-approval can create significant complications, particularly when it’s required of personnel at both the site and corporate levels. The MOC module simplifies the process with pre-approval categories. Only authorized personnel can edit these categories, and each one can be created at the site or corporate level. As with other categories, pre-approval categories can be applied to any number of user-defined MOC types. Review and approval are often time-sensitive, tightly regulated processes. The MOC module makes them faster and more consistent by streamlining the assignment of reviewing departments, individual reviewers and approvers. Administrators gain a better view of the personnel assigned to each task, and those personnel know exactly what needs to be completed and when. To ensure projects are started safely, you can use the MOC module to build pre-startup review checklists. Create questions and sub-questions, as well as multiple versions of a list based on your predefined checklist types. Ultimately, these checklist features can apply to far more processes than safety management. With the appropriate access level, you can finely control permissions within the MOC module and other BasicSafe modules, create groups and subgroups among both departments and individual personnel, and set which forms each user group can view and edit. Like other BasicSafe products, the MOC module allows you to change the language in the fields, forms and drop-down menus to accommodate your company’s culture and jargon. This capability reduces the learning curve and allows everyone within your organization to use the software efficiently. Ultimately, less time spent training and teaching means greater productivity and greater buy-in at all levels. Interested in learning more about the new Management of Change module? Contact us today for more information.